Publisher: University of Georgia Press, 1992. Hard Cover, 273 pages, 7.25 x 10.25. Today hop growing remains a viable commercial enterprise only in parts of the far western United Statesnotably in Washington. But, as James Fenimore Cooper remembered, the mid-nineteenth century in Cooperstown, New York, was a time when "the 'hop was king, ' and the whole countryside was one great hop yard, and beautiful". 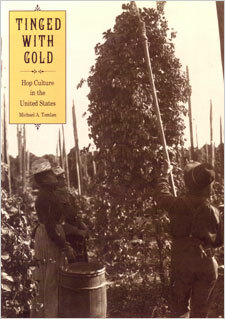 In Tinged with Gold, Michael A. TomIan explores all aspects of hop culture in the United States and provides a background for understanding the buildings devoted to drying, baling, and storing hops. The work considers the history of these structures as it illustrates their development over almost two centuries, the result of agrarian commercialism and nearly continuous technological improvement. In examining the context in which the buildings were constructed, Tomlan considers the growth, cultivation, and harvesting of the plant; the economic, social, and recreational activities of the people involved in hop culture; and the record of mechanical inventions and technical developments that shaped hop kilns, hop houses, and hop driers and coolers in the various areas where the crop flourished. The work challenges assumptions about the noncommercial nature of American agriculture in the eighteenth and early nineteenth centuries and raises important questions about the "folk" tradition of hop houses, arguing that the designs of these buildings were rational responses to commercial imperatives rather than the continuance of arcane English or European customs. Tinged with Gold brings hop culture to life as it explores the history of this neglected aspect of rural agriculture. Because the work demonstrates that the significance of a relatively obscure building type can befully appreciated if placed in its historical context, it provides a model for studying other rural structures. Drawing upon an impressive array of primary and secondary sources, this work is a definitive history of hop culture in the United States.